Academy of Management Studies (AMS), believes catalytic role of managerial excellence in transforming and developing economy into a developed and progressive one. More than 100 modern computers (Pentium IV) in the labs facilitate in learning IT and also undertake research and data processing. Internet access, availability of latest versions of software for programming, multimedia applications and printing facilities enhance the learning effect. 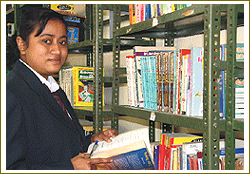 Placement assistance is provided to all students. Placements cell of AMS works closely with industry and makes systematic efforts to place the pass outs. Campus interview is a regular feature.AMS is committed to placement of its students and there is a separate active cell headed by Mr. Sourav Chatterjee . AMS takes pride in announcing 100 % placement assistance to its students.